The results are in: Portland's not bending to anti-immigrant, anti-abortion, anti-transparency, or any other fear-based rhetoric this election cycle. Of the 67 percent of registered Multnomah County voters who pitched their ballots this election, the majority of them sided with progressive leaders and policies—whether it was Portland's Clean Energy Fund, a program to support green jobs in communities of color, sweeping campaign finance reform in future city elections, or Gov. Kate Brown. Portland joined Oregon voters in overthrowing Measure 105, a pitch to dissolve the state's sanctuary status for immigrants, Measure 106, a proposal to pull abortion coverage from state health care plans, and two measures (103 and 104) that aimed to protect corporate interests in the state legislature. If the theme of Portland's May primary election was placing women of color in power, the takeaway from yesterday's election was that Portlanders want well-informed, effective solutions to the region's housing crisis. This message was most overtly cemented in the victory of Metro's Housing Bond—a measure that will use $652.8 million to build thousands of new homes for the tri-county region's lowest-income residents. And, thanks to voter approval of an Oregon constitutional amendment that would allow housing bond dollars to be used more effectively, Metro can safely promise to place 12,000 people on the edge of homelessness into affordable housing over the next seven years. That constitutional amendment, Measure 102, also expands the amount of low-rent housing the Portland Housing Bureau can build with the city's own housing bond, passed by voters in 2016. Measure 102's passage will at least double the 1,300 affordable units already promised by the city though the bond. It was clear in May that Portland would be electing its first Black woman to city council last night—we just didn't know which woman it would be. 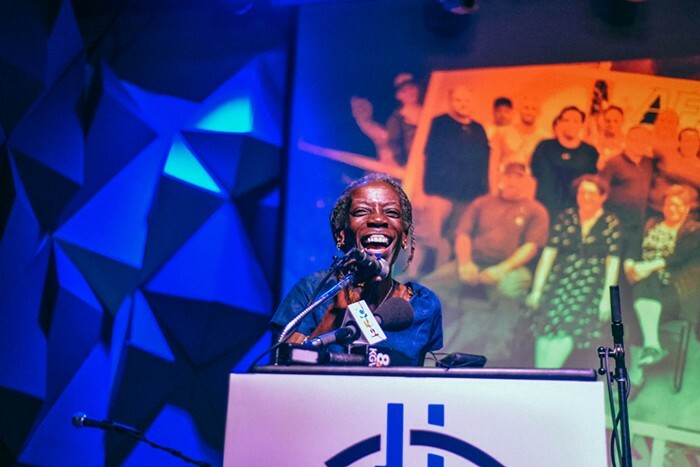 But Jo Ann Hardesty's sweeping victory is not only historic, it is a clear signal that Portland wants a leader who understands housing and homelessness. Hardesty, a former state representative and former president of the Portland NAACP chapter, has advocated for transitional and supportive housing programs—ones that offer mental health care, addiction treatment, or any other support systems to help stabilize newly-housed individuals. She's also touted the proven success of peer-run homeless villages like Right 2 Dream Too, Hazelnut Grove, and Dignity Village. Unlike her opponent, Multnomah County Commissioner Loretta Smith, she does not support a plan to place homeless Portlanders in Wapato Jail, a privately-owned abandoned jail that lies 11 miles from downtown Portland. While Smith sits on the commission that voted to sell Wapato Jail to a private developer earlier this year, she has made its future as a homeless shelter a central point to her campaign. No representatives from Portland's top housing and homelessness nonprofits have endorsed this plan, and many argue a mass shelter cut off from services and public transportation the last place the city should be placing its houseless. These concerns were echoed by other local leaders, like Multnomah County Chair Deborah Kafoury and City Commissioner Amanda Fritz, who said the millions of dollars needed to get the facility running would pull funding from other local housing programs with proven success. But Smith wasn't the only candidate to use Wapato Jail as a solution to homelessness. At an October press conference, GOP gubernatorial candidate Knute Buehler announced he would throw his weight behind Wapato as a shelter and treatment facility for the state's homeless population. This announcement followed the release of Buehler's "homelessness plan," which supports stricter rules people sitting or sleeping in public spaces (rules specifically meant to target homeless people). Like Smith, Buehler offered no financial plan as to how he would transform Wapato into a successful facility for the houseless. And, like Smith, he lost his election last night.